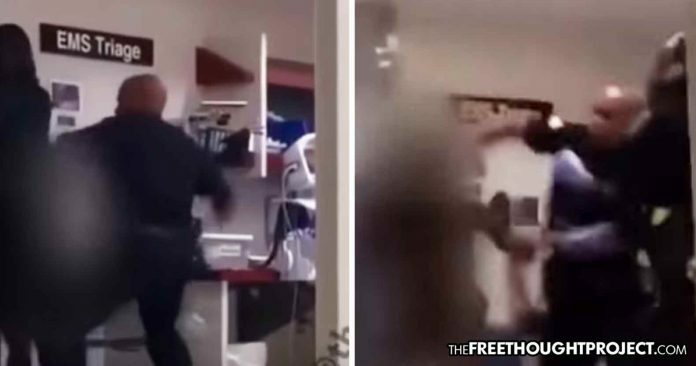 Detroit, MI — An utterly shocking video was released this week—taken from inside a hospital—of a Detroit police officer savagely beating a naked mentally ill woman. The video was sent to local news station FOX 2 by a witness to the horrifying beating. What it shows is nothing short of barbarous abuse of a defenseless woman by a public servant. Although Detroit police have refused to identify the officer, they did say that he has been suspended pending the outcome of an investigation. As FOX reports, the woman, believed to be a patient at the hospital, was punched several times. The woman who recorded the video told FOX 2 she was visiting a relative at the hospital. She said it was clear the woman was mentally unstable, though that has not been confirmed by the hospital. Detroit Police Public Information Officer Sgt. Nicole Kirkwood told FOX 2 they are conducting an internal investigation to “determine if the force used was reasonable and necessary.” Kirkwood did not comment further on the video Wednesday night, according to FOX 2. “The situation was escalated to the appropriate DMC authority. DRH security was notified who immediately filed an internal report and also called DPD. DPD responded to the hospital where DMC filed a report with them,” Kirkwood noted. On Friday, in response to the video, Detroit Police Chief James Craig said what he witnessed was “very disturbing” and noted that the investigation into the officer is a criminal one. During a press conference, Craig explained that the woman was picked up by police in response to a “lewd and lascivious in progress” call around 6:45 p.m. on Wednesday. Officers said the woman was found walking around a neighborhood naked. The responding officers gave the woman a robe and then transported her to the Detroit Receiving Hospital for evaluation. According to Craig, when the woman — who remains unnamed — got to the hospital, she took off the robe, became agitated, and began fighting with staff. At this point, according to Craig, that’s when the officer began punching her. Below is the shocking footage. If you’d like to peacefully let the Detroit police department know how you feel about this officer savagely beating a naked woman, you can do so at the Facebook page, here.